Awnings are very helpful for keeping decks, patios, and other outdoor seating areas cool and comfortable in spite of the bright, hot sun. If you are trying to find a quality shade system for the patio or deck area of your home and don’t know where to turn, you can put your trust in Patio Systems. We proudly install beautiful, durable, and reliable retractable deck or patio awnings for homeowners in Lewes and the rest of Sussex County, Delaware, and we pride ourselves on delivering The Hot Deck Solution. As the most recommended local shade product company, we at Patio Systems are committed to providing the best customer service possible during installations of our other products. In fact, we hold an A+ rating as an accredited member of the Better Business Bureau, which reflects our commitment to achieving 100 percent satisfaction from our customers. Our team of expert, factory-trained installers is made up of our own employees, not subcontractors, so you can trust they’ll deliver courteous service and quality workmanship during your project. 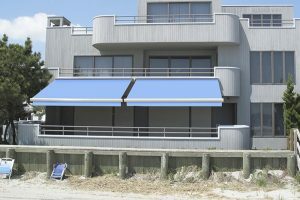 For more information about the patio awnings and other types of shade structures we offer to homeowners in Lewes, Delaware, and the rest of Sussex County, contact Patio Systems today.